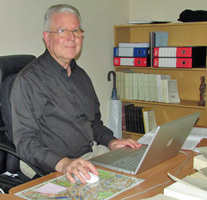 Bolivia-based Marist missionary, Fr John ('Hoppy') Hopkinson SM, is home for a month's visit. 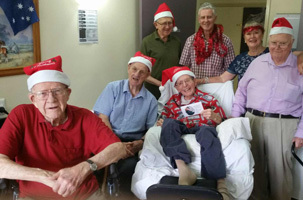 Fr John joined Montbel Marists for their Boxing Day celebration recently before moving north to his native Brisbane to visit family and supporters of the 'Misioneros Maristas' in Tarija. 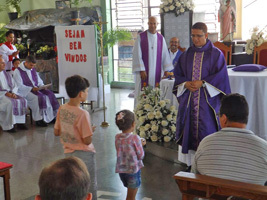 In May he will celebrate forty years as a missionary in Latin America. Welcome home, Hoppy! 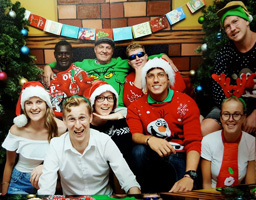 'It was too late to get Christmas cards', writes Bishop Paul Donoghue SM from the Cook Islands. 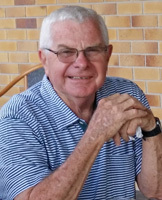 From Auckland, NZ, Fr Justin Taylor SM happily reports the completion of the definitive biography of Marist Founder, Jean-Claude Colin. He adds that much work still needs to be done before the book can be published. 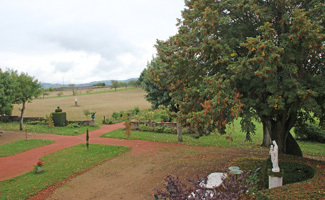 The final chapter (29), appropriately titled 'Mission Accomplished', records the last years and days of Fr Colin's life, including his death and burial in the grounds of La Neylière, France. The completion of this definitive work opens the way for a range of smaller texts and publications benefiting from the research and scholarship of recent years. 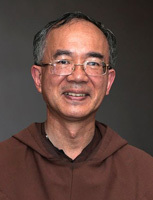 Congratulations and thank you, Fr Justin! 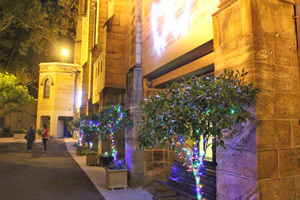 Pope Francis has appointed Carmelite, Gregory Homeming OCD, as the sixth bishop of the diocese of Lismore, NSW. 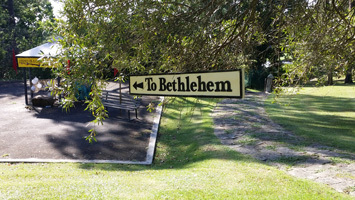 Bishop-elect Gregory, currently the Regional Vicar of the Discalced Carmelite Friars in Sydney, succeeds Bishop Geoffrey Jarrett who has led the Lismore diocese for fifteen years. 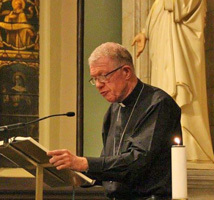 We congratulate Bishop Gregory and welcome him to the diocese where Marists have ministered since the establishment of St John's College, Woodlawn, in the 1930s, and we wish Bishop Geoffrey a happy retirement. 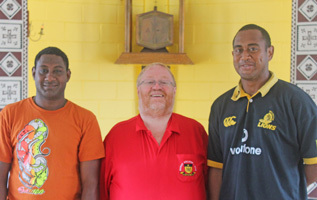 Australian Marist formator, Fr Tony Kennedy, reports on the 'Hesed' program for young religious at the Marist Brothers' centre, Lomeri, Fiji. 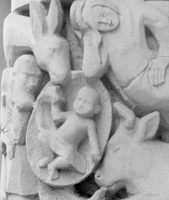 Hesed 2016 has been one Fr Tony's last pastoral engagements in the Pacific before leaving in the New Year to direct the Colinian Period of Renewal at La Neylière, France. 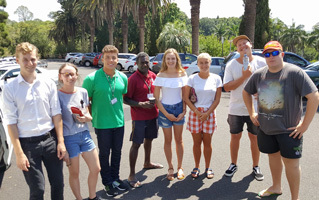 A team from the Marist Charism & Culture group (MCC) joined young adults from Australia and NZ for this year's Marist Youth Leadership program. 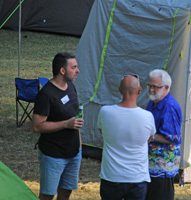 The week-long event was held at St John’s college, Woodlawn, NSW, facilitated by the Kiwi MYL team led by Fr Mark Walls SM and the Australian MCC committee. 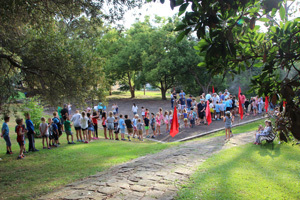 'MYL provides the students with a unique stepping stone for young Marist life. 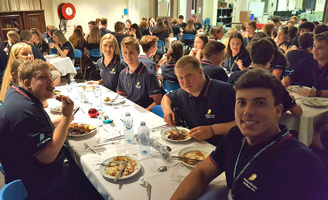 It is the flagship and first port of call for much of Australia’s Marist vocational ministry, be it to Religious life or Laity and it is a resounding success. 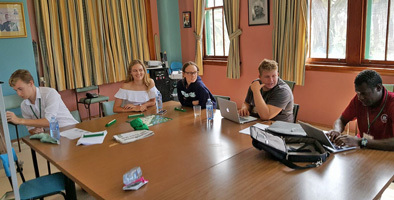 The students who leave this programme, take with them a questioning, a network of Marist contacts and a kick start to their love of Marian living. 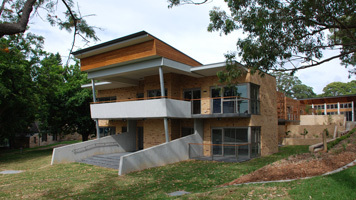 'MYL is a fantastic space for students from many Marist Schools to express their love of the Marian way of life and to grow in their formation of the Marist Charism. 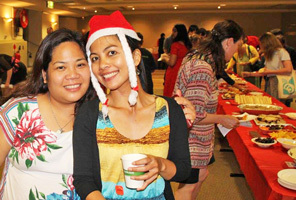 Hundreds of Sydneysiders and tourists joined in Christmas carols as the annual St Pat's Carol Walk sang its way through the streets of Sydney on Dec 11. 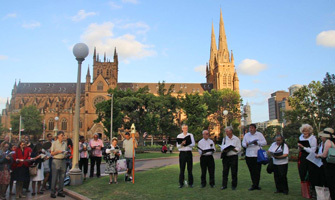 After prayers by St Mary's cathedral led by St Pat's parish priest, Fr Michael Whelan SM, the group wended its way through Hyde Park, the Westfield Mall, Martin Place and George St, finishing St Patrick's, Church Hill. 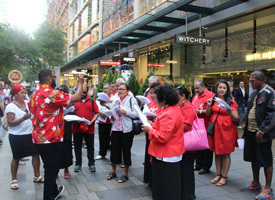 This year's carollers included Bishop Terry Brady and choristers from St Patrick's and the Fijian Catholic community. 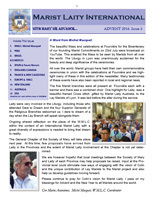 From Rome and the headquarters of the Society of Mary, secretary, Sophie Janssens, has sent the special prayer to be used in preparations for the General Chapter of 2017. 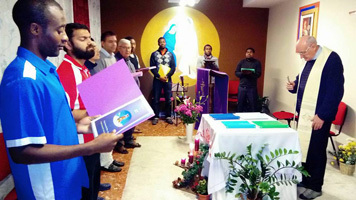 In seven languages the prayer card features the image of 'Our Lady of the Journey' recently enshrined in the General House. Thank you, Sophie! 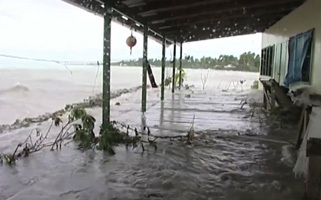 'Last month two climate activists from Kiribati - Tinaai Teaua and Vasiti Tebamare - came to Australia to call on our leaders to take urgent action on climate change. 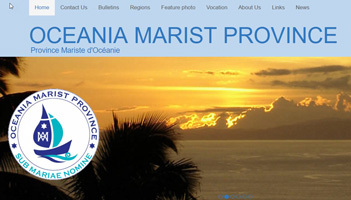 Oceania Marist Province's web site is a source of engaging images of the Pacific. 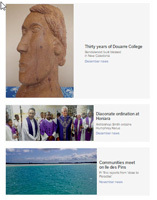 The revamped site has regular news bulletins of the province as well as feature photographs of life in Oceania. 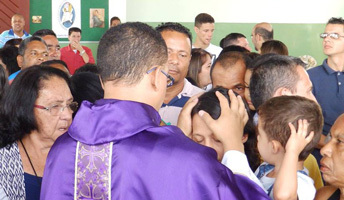 In a ceremony on Nov 26 in the parish of St Gabriel, Belo Horizonte, Brazil, young Marist, Lauro da Silva Ferreira was ordained priest. 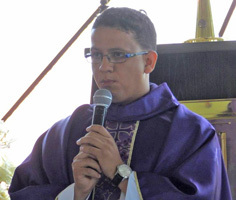 Fr Lauro is the latest graduate of Casa di Maria (Marist International Theologate, Rome) to be ordained this year. 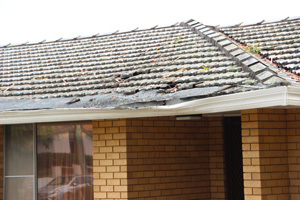 While Montbel resident, Fr Allan Connors SM, serenely watched Sydney's late-afternoon thunderstorm over Hunters Hill on Dec 05 lightning struck a few metres away. 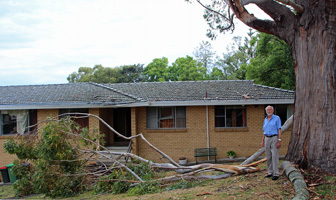 Large limbs crashed from a neaby giant eucalypt, causing damage to the roof of Oceania House and disturbing a flock of cockatoos -- and Fr Allan's reveries. Pictured: Fr Allan moments after the storm... and the Montbel storm-watching vantage point. 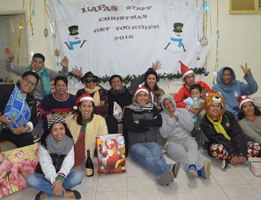 Villa Maria's third annual overnight camp for fathers-and-kids happened on Dec 03-04. 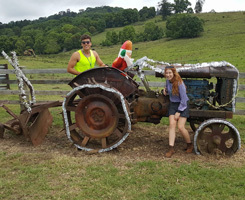 With 'Camp Runamuck' (a.k.a. 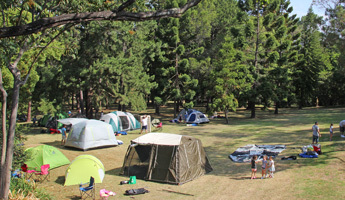 'Runamok') a small sea of tents appears, then disappears, in the usually-serene and ever-picturesque grounds of the monastery at Hunters Hill. 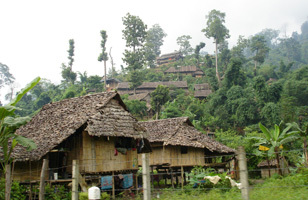 Latest from Marist Mission Ranong, Thailand. 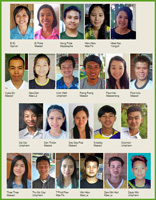 A record twenty-two young Burmese have commenced the latest 'Bridge Program', sponsored by the JPICC of the Marist Australian Province. 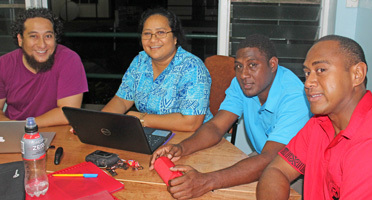 The 20-week online program offers refugee youth skill development to prepare for tertiary studies. 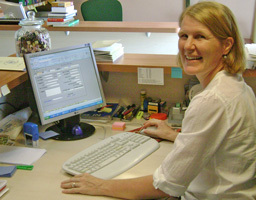 BP-ers' participate in weekly group Skype video tutorials as well as submitting regular assignments and special projects. 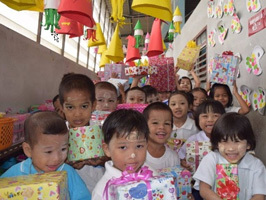 Below: Some of the smiling faces of participants in BP16-17; Mae La refugee camp, on the Thai-Burma border. 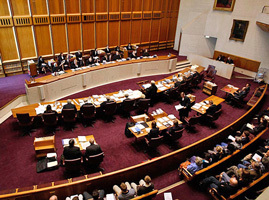 'Today I am going to send you some photos of my sister's house in Kyoto where the first group of Marists from Australia stayed for a while. I thought you might be interested in this house. 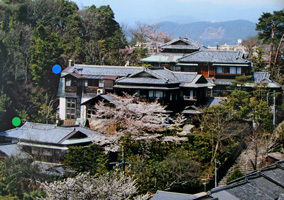 'The parlour was used as a chapel and the priests lived on the second floor in rooms of typical Japanese style with tatami mats.The view from the rooms is really beautiful with a big cherry tree in the garden and famous Mt Daimonji nearby. 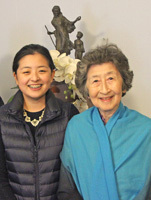 'My elder sister, Nobuko, living there now with her son and his wife. 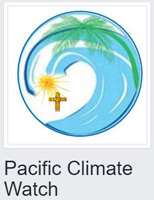 became a friend of Fr Paul Glynn who visited there several times. 'I wonder how they felt about living in a strange country for the first time - maybe they got homesick. 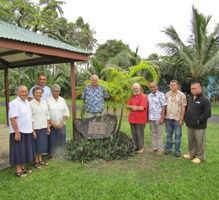 Because for them everything was new and different,or their hearts were burning with the coming missionary works in this non-Christian country with which they had been fighting fiercely until then.